More and more brands irrespective of sizes and types are using video as a powerful tool for engaging customers. Companies have their YouTube channels for promoting their services and products online. While it is a challenge to increase the number of subscribers, it is equally challenging to turn subscribers into customers. There are few things to follow to get the benefits of increasing conversion rates. This is important for compelling the subscribers to become customers. Listening to the subscribers helps them to know what they prefer and want. Based on the feedback the subscribers also can make changes to their marketing strategy. Subscribers, when knowing that the brand is listening to them, feels that they are a priority for the company that builds trust and brand loyalty. Offering special discounts to subscribers at the online store is a powerful weapon to increase conversion. The chances of conversion are increased by offering email/newsletter subscription offers. It helps in building email list also which is very important for online retailers. Having the mail details of the subscribers gives an opportunity to promote new products in future. Try encouraging the subscribers to convert into customers with first-time shopper offers. It could be a discount on price or offer for free shipping of the product. Encourage them to spend more with special offers on the total value of shopping cart. To increase the subscribers for YouTube channel, the first thing to follow is to produce regular content. The audience wants to more entertainment and if you give them what they want they are sure to subscribe to your channel. Drive subscribers by adding the subscribe button in your blog also. To double the audience and the increase subscriptions collaborate with other YouTubers and reach new potential subscribers. Customer testimonial videos are proved to have a highest effective rating in influencing conversions. Buying decisions are influenced by testimonial videos by ninety percent. Customer review testimonial videos make the potential audience trust the brand. Simply having testimonial videos can help in converting the subscribers into customers. Testimonial videos help to add creditability, trustworthiness and reliability. • Engage the subscribers with shareable content. The more likes, shares and comments, the more engaging fans. Create interactive video content. Have a clear call to action such as visiting the sales page etc. so that the subscribers interact with the brand. Sales funnel begins with subscribers visiting the website or an app. When you are directing the subscribers outside YouTube channel offer something valuable such as a free e-book or contest entry. Use email marketing to build relations with the subscribers. Personalize the messages by mentioning the name of the customer in the letter. • Introduce sale opportunities also through email, and this is the best place to convert subscribers into customers. Balance your content with sales messages sends emails to subscribers to check the latest products on the sales website. Hundreds of subscribers are not going to produce revenue it is important to reach a significant targeted audience. Use the best video of your as the channel trailer and place the click now to subscriber icon in your videos to increase the subscribers. YouTube video marketing is not just for selling. It is for helping the audience with their problems and telling them your service or product can help them solve the problems. 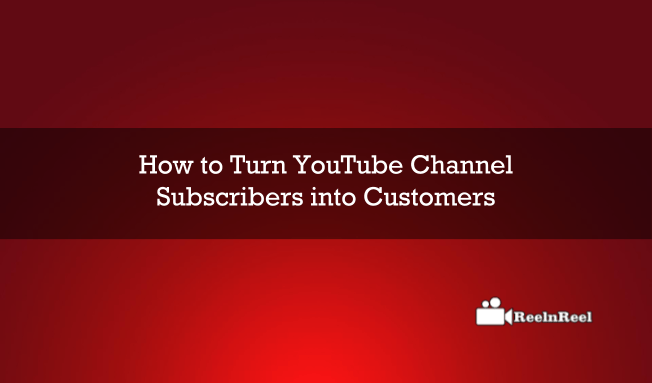 Take the help now and sell later approach is the best to convert YouTube subscribers to loyal customers.